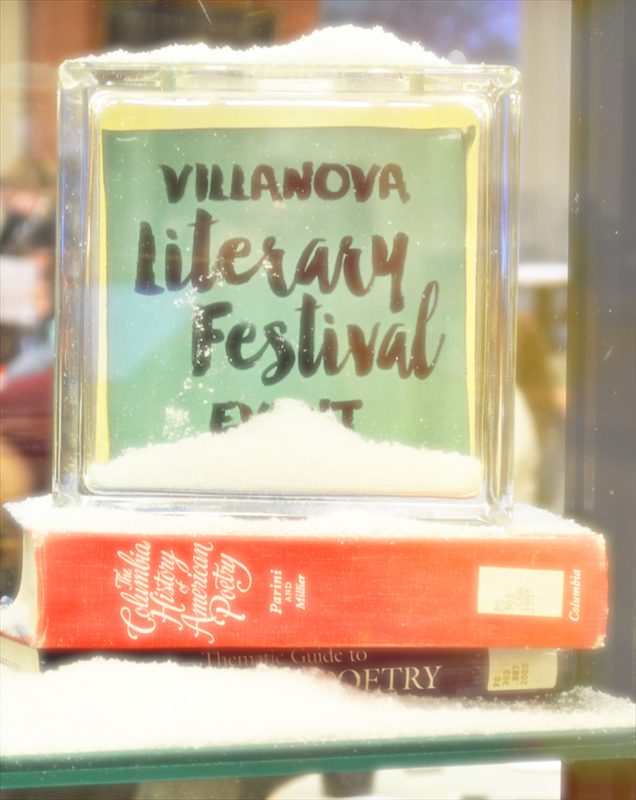 The current exhibit in Falvey’s cultural window to the left of the entrance to Holy Grounds is “All Dressed Up and Somewhere To Go: Spring 2015 Events: Scholarship, Culture, Poetry.” Especially appropriate for this January weather, the exhibit features penguins and snow. “All Dressed Up and Somewhere To Go …” promotes events that will be held in Falvey during the spring semester. Glass blocks displaying photographs and signs advertising planned events fill three shelves. Books written by speakers are also included as are some origami penguins. A large sign at the top of the window—a photograph of a penguin’s head on one side and the exhibit’s title on the other—proclaims the “All Dressed Up …” theme. The three shelves in the center hold the glass blocks; books by some of the speakers accompany their photographs. Small black signs provide the date, time and location of various events. Artificial snow is scattered on the shelves and on the glass blocks. 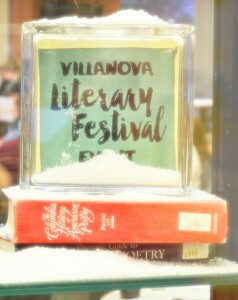 To frame the exhibit, Kallie Stahl, graduate assistant for the Outreach team, painted snow in the upper corners of the window and across the bottom. On each side stands a group of three penguins. Joanne Quinn designed the exhibit and its graphics. 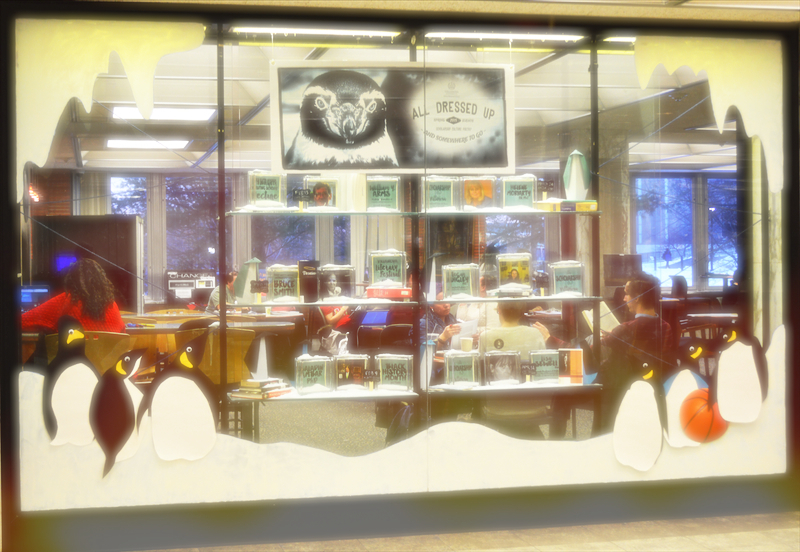 Molly Quinn, a work study student for the Outreach team, assembled the photographs and text panels in the glass frames, created the origami and scattered the snow, creating the wintery ambience. Article and photos by Alice Bampton, digital image specialist and senior writer on the Communication and Service Promotion team.